Street works policy is facing unprecedented levels of change. 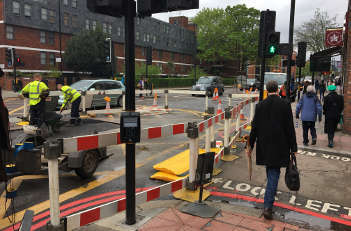 Over the last 12 months there have been a significant number of government initiatives introduced, with the intention of reducing the impact of street works on road users. This week the Government set out the next steps in relation to two key initiatives: the approach to how local authorities can introduce lane rental schemes; and the announcement of Street Manager, a new digital tool to support the planning of street works. This week’s publication of the criteria and guidance for local authorities wanting to establish a lane rental scheme is a welcome step forward. This provides clarity for how such schemes will operate, and gives some certainty to the utilities sector that the right safeguards are in place to ensure they are used effectively. Concerns with the concept of lane rental schemes remain. There is a worry it will add an extra layer of complexity on top of the myriad schemes that are currently in place and that it could inhibit the roll-out of major infrastructure schemes. Fundamentally, lane rental does not provide any tools that do not already exist. Highway authorities already possess the powers, and the duty, to co-ordinate and manage street works effectively. Despite these concerns, industry will want to work with government and local authorities to ensure that the implementation of lane rental schemes is a success. The guidance provides a positive framework that sets out the right checks and balances to ensure that these schemes are not used inappropriately. While this is not statutory, it makes clear what government expects of local authorities before it approves a scheme. The process that the Department for Transport (DfT) has set out is rigorous and broadly provides reassurance to the industry. The reiteration that lane rental should only apply to up to 5% of an authority’s road network and the parity that will be provided by lane rental schemes applying to all works including local authority works are both important and welcome. Similarly by requiring that charges only apply at certain times of the day, utilities and their contractor partners are given the opportunity – and the incentive – to work at off peak times. However, there remains a concern that the warm words on ensuring lane rental schemes take consideration of nationally important infrastructure projects are not accompanied by the detail that our members require. While there is a clear exemption for HS2 works, detailed information on how works relating to electric vehicle charging points or broadband roll-out will be taken into account are missing. The industry urgently needs greater clarity from DfT to ensure that this does not negatively impact on major productivity-enhancing works. The Street Manager project has the potential to revolutionise how works are planned and delivered across the UK. A new digital system can take advantage of new and existing technologies to allow members of the public to best understand upcoming works, and to adapt their journeys as a result. Our members want to ensure that the public are as informed as possible and able to avoid disruption where they can. We’re delighted to have been working closely with the DfT and the project team to feed into the process, and we’re committed to continuing to provide this support to ensure that the project is a success. For the system to work most effectively it will be essential that it is aligned with, and reflects, the systems and processes that our members have in place. To have the impact that government is looking for, the new software needs to be mandatory for both utilities and highways. While there should be a transition period in place, and sufficient notice to allow for the switch, relying on voluntary uptake will not deliver the necessary benefits. Consideration needs to be given to how all participants can be required to migrate to the new system. Both these initiatives have the potential to improve how street works are delivered, if implemented in the right way. At the same time as these policy initiatives are being introduced the demands on the industry are growing. The importance of street works is becoming increasingly recognised by policymakers. For government to achieve its policy objectives in relation to building the homes that Britain needs, delivering the superfast broadband to improve productivity and rolling out electric vehicle charging points to reduce emissions, street works are essential. Achieving these ambitions while also reducing disruption for road users is may be difficult, but is certainly possible. There is no fundamental inconsistency between these aims, but it will require industry, government and local authorities to work closely in partnership and for changes to be carefully implemented. As an industry, we’re fully committed to doing our bit to make these initiatives a success. Clive Bairsto is chief executive of Street works UK, the only trade association representing utilities and their contractors on street works issues. It promotes best practice, self regulation and a two-way relationship with government and other relevant stakeholders. Street Works UK is also the utility arm of the Highway Authorities and Utilities Committee (HAUC(UK)), working collaboratively with roads / local authorities and national and regional governments to drive up standards of road and street works in Scotland, England, Northern Ireland and Wales.